One strange fact of our family history is that had it not been for three major wars you and I would not be alive today. All three wars had a direct bearing on the circumstances leading up to our births, and had it not been for any one of them neither you nor I would have come to be. 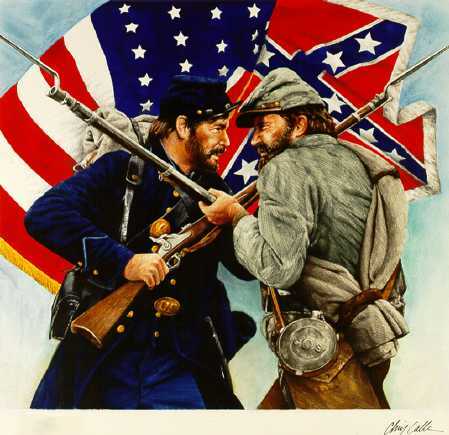 The first major war that led to our existence was the American Civil War. You may recall that in a previous post I told you about your great-great-great-grandmother, Margaretha Reis, nee Bitzermann. Before she married your great-great-great-grandfather, Michael Anthony Reis, Margaretha was briefly married to a Civil War veteran, one Count Adam Begonski originally from Silesia, Poland, who led the 69th NY Regiment during the war as a Colonel. Begonski died soon after the marriage of war-related injuries, and Margaretha subsequently became remarried to Michael Anthony. Michael and Margaretha Reis had a daughter, your great-great-grandmother, Emma Reis, who when she grew up married your great-great-grandfather, Henry John Kotz. 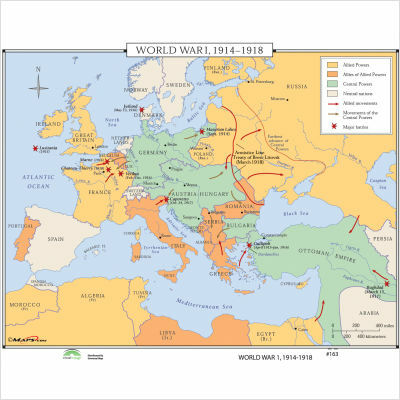 The second major conflict that led to our births was World War I. Before she married your great-grandfather, John William Kotz, your great-grandmother Esther Adele Kotz, nee Johnson, had been married before to a Harold Blakeley, a Sergeant in the U.S. Army’s 69th Regiment. Harold, however, was killed in action the day after Armistice Day, November 11, 1918, when Esther was just 22 years old. After they married, John and Esther Kotz had a daughter, your grandmother, Gertrude Marie Kotz, who went on to marry your grandfather, Philip Del Vecchio. The final war that caused us to be born was World War II. 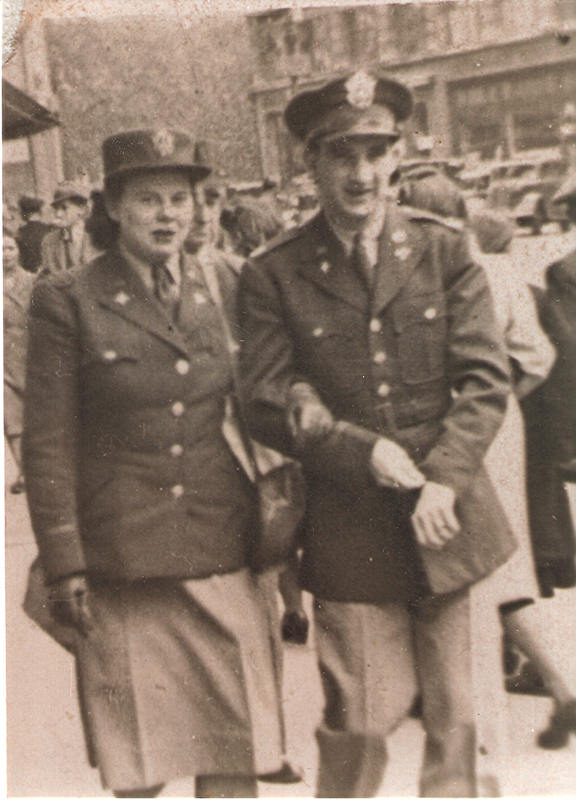 Although Poppie and Nonnie grew up within about 25 miles of each other (Poppie in Newark, NJ and Nonnie in New York City), it wasn’t until the two were stationed overseas during WW II that they found each other. After the war broke out, both Poppie and Nonnie enlisted in the military and both were stationed in England, where they eventually met and fell in love. The couple went on to get married and had a son, your father, Anthony. Life is strange. War is a terrible human tragedy, yet had it not been for these three wars, we wouldn’t be alive today. I often wonder, due to the unique circumstances of our family history, how many lives came to be as a result of war, and how many lives that could have come to be never did. Hi Bernadettte! I had to look that up on the Internet, but I think that makes us third cousins (mutual great-great-grandparents (Michael and Margaretha Reis). I take it you have been doing some genealogical research like I have. Let me drop you a line via regular email. What you found on this blog is about all the information I have about our great-great-grandparents. I’d be interested in any new information you might have. I see. Michael and Margaretha Reis were my great-great-grandparents, so yes, we’re second cousins once removed. Complicated! My mother was very clear on Margaretha’s maiden name, Bitzermann. I guess you read my other post to my daughter with more specifics on that lineage. I grew up in New Jersey but now live in Tokyo, Japan. I’ll drop you a line on your regular email with my address there. Hello Everybody!! You are my family!!!!!!!!!!!!!!!! I am Jacqueline Anne Kotz, daughter of John William Kotz, Jr. who was the son of John William Kotz, Sr. and Adele Cokely. I just found out about you today!! From Carol (carolezig56 on Ancestry.com). It is going to be such a thrill getting to know you. I am an only child and have always felt lonely, but now I have real live family members to converse with and get to know. Woo=Hoo!!!!!!!!!!!!!!! And with all this wonderful information contained herein I am going to get busy and fill in the blanks on Ancestry. Take care all, I love you already, Jaci. Hello Tony, I am one of your long lost cousins. Jack, John William Jr. was my father. I left a comment yesterday but it seems to have disappeared so I will wait for your reply via my normal e-mail address. Would love to talk w/you, so very happy to have found you. Take care, I hope we can write soon, Love Jaci. No, sorry, you didn’t disappear. When someone posts a comment on this site for the first time they have to be approved by the admin (that’s me). Was just busy with my university classes the past couple of days, end of term approaching kind of stuff. Hey Jaci, let me drop you a line via regular email. I have about a million questions for you, naturally.